Monin UK is celebrating London Cocktail Week 2015 with a host of events, competitions and master classes. Monin will be based at Barrio East throughout the week, and will stage its first ever amateur cocktail competition there in partnership with premium tequila Herradura. Visitors to all three Barrio bars across London (Central, North and East) will also have the chance to win an iPad in Monin’s ‘Guess the Flavour’ competition. This Underground Punch Pong League was launched in 2013 by JJ Goodman. 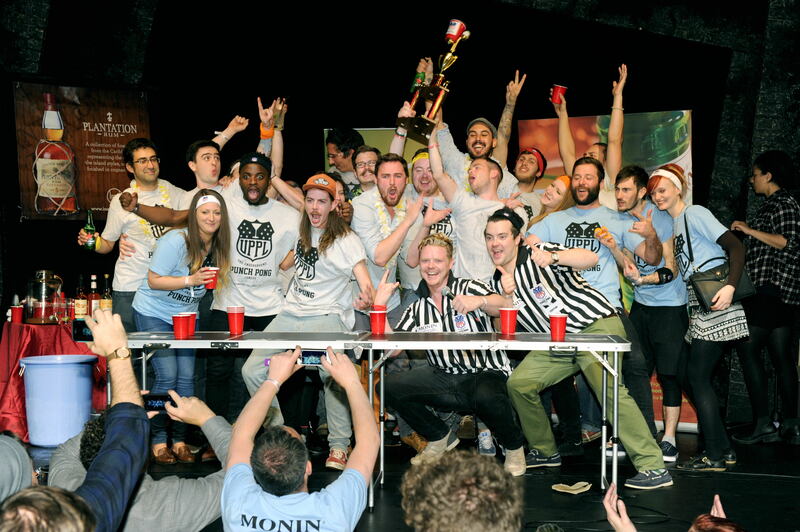 This summer, the UPPL travelled the UK , pitting pairs of bartenders against each other in a ‘Beer Pong’ style tournament – but instead of beer, players used the London Cocktail Club’s Black Pearl Punch, using Monin Syrups and Plantation Rum. On the opening night of LCW, the London regional heat will be followed by the Grand Final, where all the regional winners will compete for the title of ‘UPPL – Monin & Plantation Bartenders Challenge Cup 2015’ champions. As well as bragging rights as national Punch Pong champions and an impressive trophy (pictured with last year’s champions Conor Brennan and John O’Reilly from Love & Death, Inc. in Belfast), the overall winners will receive tickets to an NFL game at Wembley Stadium. Join Monin UK Brand Ambassador James Coston for a talk on the global Monin brand. This one-hour session will cover the company’s 100-year history, production process and ingredients and an insight into the latest flavour trends, followed by a demonstration of how to use Monin syrups in a range of classic cocktails. Calling all amateur mixologists – there’s a £250 bar tab up for grabs! Join James Coston from Monin and Nicci Stringfellow from Herradura Tequlia for a masterclass on the two premium brands, complete with hints and tips on how to make top twisted tequila cocktails. Entrants will then have 30 minutes to split into teams and come up with their own cocktail recipe, before presenting it to the judges at the bar. The winning team will receive a £250 bar tab to be spent at any Barrio bar. Entry is £20pp including refreshments. For more information or to register, visit the London Cocktail Week website.